Groz Beckert industrial sewing machine needle - 134-35LR Leather point, available in sizes 120/19, 130/21 and 140/22, in 1 x packet of 10 needles or 10 x packets of 10 needles. Cuts the leather to the right (see diagram) at a 45° angle in the direction of sewing. Slight to medium slanted stitch formation, depending on the leather. The sewn thread is slightly elevated. Stitch holes are easily visible. Suitable for short to medium stitch length. 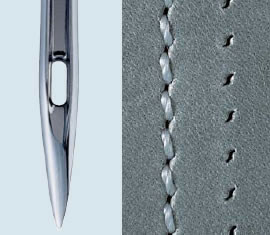 For the production of decorative seams on soft, medium to hard leather. Can be used on almost every type of leather. Shoes, bags, leather garments and suitcases.